Consists of two fine show-rooms, in which are to be seen the most curious and interesting specimens of marble and spar found in the surrounding country, manufactured into vases of the most exquisite beauty. We would particularly refer the visitor to some of the large Bell and Etruscan Vases, which are equal, if not superior, to similar productions of the ancients. The original of the beautifully formed Etruscan Vase, commonly called the " Devonshire Vase," was brought from Italy by the present Duke of Devonshire, who wished to ascertain whether the workmen of his own county could imitate it. It was left with Mr. ValIance, who in the course of a few months had the honour of executing some in black marble for the noble Duke. The rapid sale which the Devonshire Vases have since experienced, bears testimony alike to the Duke of Devonshire's taste, and the ingenuity of the Derbyshire workmen. "Banks' Obelisk is another beautiful specimen of workmanship. The hieroglyphics are beautifully depicted by the application of an acid, and the Greek inscriptions prove the extraordinary accuracy with which it is executed. This obelisk is doubly interesting, on account of its being associated with the name of Belzoni, who brought the original from the island of Phil, in Egypt. It is now erected at Mr. Banks's seat, in Dorsetshire." The "Diamond Engravings," upon black marble tablets, by Mr. Rayner (we believe exclusively pos- sessed by Mr. ValIance), may properly be considered the most interesting, as well as the most attractive objects in this collection. We have heard of many novel methods of drawing, painting, and engraving, within the last four or five years, but they have uniformly been inferior: these are of a higher order ; and we hesitate not to say, that Mr. Rayner has executed some subjects that require the half tone of moonlight, in a manner equal to any of our moonlight painters. Mr. Vallance has been a manufacturer in the marble business for upwards of thirty years, and from his long standing in this place, and from the great interest he has always taken in the productions of the county, on all subjects of local importance. His name has indeed become associated with Matlock Bath, as an obliging and communicative resident. Mr. Rhodes, the author of " Peak Scenery," in his description of Mr. Vallance's Museum, says, "under the taste and direction of Mr. V., the workmen of Matlock have been instructed and improved in the various articles which the spar and fluor works produce." - The Matlock Companion likewise describes Mr. Vallance "as a gentleman, who from long experience, is very conversant in whatever relates to the natural productions of Derbyshire." Indeed a visit to this Museum will prove a rich treat, as well as an agreeable lounge, but more particularly to the geologist and collector of minerals, as he may here meet with a choice collection of every specimen of minerals which Derbyshire produces; there are no less scientifically arranged; each separately labelled, and they are admirably adapted for the studies of geology and mineralogy. We believe the whole cabinet does not exceed the moderate price of twenty-five shillings. To Mr. Vallance the public are indebted for the first introduction of the Black Marble, obtained from a quarry near Ashford-in-the-Waters ; it bears a beautiful polish. This gentleman is now turning his more immediate attention to the Amethystine fluor, or Blue John, this being in his opinion, the only gem of the County. So scarce and valuable is this fluor, that there is only one mine in the world where it can be obtained, to which, in company with Mr. Vallance, we paid a visit. Our readers may have some idea of its value when we inform them that the stone fetches the enormous sum of forty guineas per ton, in the rough, independent of the expense of carriage. Mr. Vallance, however, seems fully to appreciate its value, for he is by far the greatest purchaser and largest manufacturer of any of his competitors. The mine from whence it is obtained is about a mile and a half from Castleton, in a mountain called Tray Cliff, extending from Mam Tor to the Winnats, on the road leading to Buxton. It is really astonishing that such a beautiful production of the mineral kingdom as the Amethystine fluor, should for such a length of time be looked upon as unworthy of attention. Its qualities, however, have at length begun to be fully appreciated - its known rarity has enhanced its value ; it is consequently to be found in the splendid palaces of the nobility, and forms an article of virtù for their cabinets. Its variegated colours are rich and beautiful in the extreme. In the estimation of foreigners it is a gem beyond all praise, and is by them sought after with an avidity truly astonishing. "BLUE JOHN. - In November, 1842, we had the pleasure of presenting our readers with an historical account of this most beautiful spar, in which we took occasion to notice a very celebrated fluor vase, executed for the late Mr. Mawe, then and now standing in the old Museum at Matlock Bath. We believe we were right at that time in saying this was "the largest work ever executed in the Blue John in its natural state" but it does not appear that we were so correct in stating that there was "not the slightest chance of finding stone sufficiently larfge to match this wonderful production," and in pronouncing it to be 'matchless! 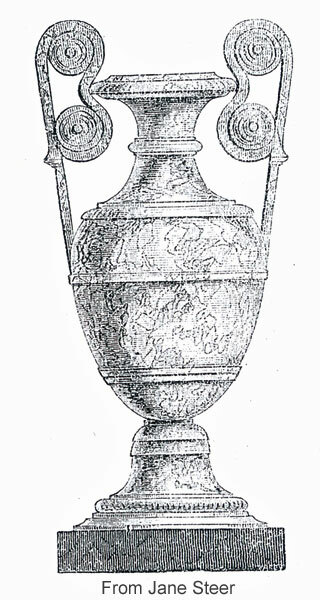 We will not now inquire how far that account stimulated our old acquaintance, Mr. Vallance, of the Centre Museum to dig and delve in the Castleton mines, but at once candidly acknowledge that an exquisite vase in Blue John spar, recently completed by him, has, indeed, both for quality of stone, colour, form, and size, no rival in the world. We are informed it is executed from three double stones of the soundest description. The colour is a pure blue and white, brilliant and cheerful, and therefore, in that respect, very far superior to the one we formerly noticed, which is dark in colour. The shape is perfect Grecian, and the size is absolutely startling - measuring three feet five inches from the base to the top of the handles, and more than forty inches in circumference. Many of our readers are aware that the material of which we are speaking has always been considered so precious that the forms of the vases have almost invariably been sacrificed. The economical use of the stone has increased in proportion to its value, and, consequently, all the best specimens of Blue John are to be found in the most ugly dumpy-looking things which go by the name of vases. The work, executed for Mr. Mawe, twenty years ago, is, from the reason just given, very deficient; the neck is almost as large as the body, and therefore, while its size always excited the admiration of the public, the extreme clumsiness of its form has never escaped the observation of the man of taste. This blunder, we are happy to say, Mr Vallance has entirely escaped, and has executed a vase which, from its form alone, is worthy of a place in the choicest repository of Grecian art. We hope that it will not fall into the possession of some merely wealthy man, where it will be hid for ever from the public inspection; but that it will find its way into one of the royal galleries, or into some nobleman's collection, where it may constantly be brought under the notice of the élite of society." We cannot close our remarks on this Manufactory without specially alluding to the Mosaic or inlaid tables made by Mr. Vallance ; they are in truth elegant specimens of art, as well as beautiful illustrations of the local productions and manufacture. In some of these tables the malachite of copper from Siberia is worked up with very great effect; the colour is the richest opaque green, with darker lines, sometimes in circular nodes and sometimes in veins, and the effect in contrast with the black marble is beyond description; we understand Mr. ValIance possesses this valuable and rare stone in large quantities, which gives him a great advantage over his contemporaries. MESSRS. ADAM AND Co's. Museum. This Museum was originally Mr. Mawe's, and Mr. Vallance (the present proprietor of the Centre Museum) was for twenty years the sole agent of Mr. Mawe. Here may be seen a great variety of the spar and fluor productions of Derbyshire, with a choice selection of urns, vases, groups and figures. Amongst the elegant display of articles here produced, we must not forget to notice the chaste and classic tables of Black Marble, on which are introduced beautifully engraved views of Chatsworth, Haddon, Alton Towers, Hardwick Hall, &c;, executed in a pleasing style, by a local artist. But as regards our description of this establishment, we will let the author of the Gem of the Peak, speak for himself.-" The management," he says, " of the wholesale and retail trade, and conducting of the manufactory have devolved on Mr. Adam (from Cheltenham), where he had most efficiently conducted that fine establishment for many years, and under whose management , this place has lost none of its energy or success; on the contrary, the trade has been much extended and increased. The entrance to the Museum is up a flight of stairs: the show room is of excellent dimensions, and most admirably adapted for the display of the beautiful wares so tastefully arranged; the stock is costly, rich, and elegant, not only in the productions of this country, but in fine specimens of foreign minerals, fossils, and shells, with many wonders of the Eastern hemisphere, both in their natural and artificial state. MR. BUXTON'S MUSEUM. - We were politely shown over the room by the proprietor, and noticed a good collection of Spar and Marble ornaments, minerals, fancy articles, and Derbyshire wares. "Mr. Buxton," observes the author of the Gem of the Peak, " was brought up to a far different business, that of a carpenter, but took a liking to this, having obtained an insight into it while employed by Mr. Vallance." THE SPAR SHOPS. - Of these there are several, the best of which is kept by Mr. Smedley, the proprietor of a petrifying well, which may be seen at the back If of his premises; the charge is only three-pence. Mr. Walker has a spar shop across the ferry, and manufactures a few of his own goods: the assortment is good, and none of the articles expensive. Mr. Joseph Pearson has a shop near the Obelisk; Mr. John Smedley, one close to Saxton's Hotel; Mr. Boden, by the Post Office: and Mr. Bryan (the Guide), near Hodgkinson's Hotel, has also a collection of minerals and spars for sale. Mr. Hartle, comb manufacturer, has a Bazaar, for the sale of toys and fancy goods, which is situate on the Green, near the New Bath. Henricus (1843) "The Matlock Tourist; and Guide through the Peak, embracing Matlock Bath, Haddon, Chatsworth and C", published Matlock Bath. There's a handwritten note to Mr. Vallance is inside the front cover. From the copy held at Derby Local Studies Library (ref DLSL 143) and published here with the librarian's very kind permission. Also very grateful thanks to Jane Steer for generously providing copies and all her help and interest.